An old flame and potential client reenters Roger Sterling's life, Joan's husband searches for a new job, and Don finally comes clean to Betty about his true identity. Researcher: [Annabelle Mathis and the Sterling Cooper creatives are watching a focus group of three dog owners and a researcher through the two-way mirror] How would you describe your dog's temperament? Griffon Woman: [through mirror] She's picky and, ah, she's nervous sometimes, but she's very smart. Researcher: [through mirror] And yours? Mutt Man: [through mirror] He's independent, you know? He knows what he likes. He's pretty hard to fool. Smitty: My God, they're describing themselves. Don Draper: This your first group? Mad Men; one of the most acclaimed series by critics, loved by the fans and buzzed at the award shows, is a character driven series created by Matthew Weiner depicting the inner world of an ad agencies set in '60s in New York. The writing is sharp, elaborative, adaptive and exquisite that keeps the audience tangled in its not-so-likable and faulty world on the edge of their seat. It is rich on technical aspects like projecting the chemistry among the characters, stunning cinematography, beautiful camera work, references mentioned in the conversations and the classic tone of the series that makes it supremely watchable. The primary reason why the series stands alone is not only its nature to work in a metaphorical way but to weave out a poem from the sequence, is the genuine soul behind it that attains a certain closure in each episode. The performance objective is score majestically by the cast especially by the protagonist Jon Hamm who is supported convincingly by the cast like Elisabeth Moss, Vincent Kartheiser, January Jones and John Slattery. The practical conversations, the whistle-blowing dialogues, three-dimensional characters, excellent execution, finely detailed set-pieces, alluring costume design are the high points of the series that helps it enter the major league. The third act of the series has a common theme of confrontation whether then it be of truth, sins, issues that helps each character swallow its own existence and accept it along with some smart business tactics and intense dramatic morale conflicts that offers a poignant yet cathartic experience. 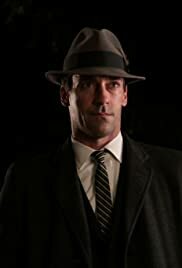 It is impossible to not be moved by Hamm's performance in the final act especially the meltdown sequence which is shot beautifully and elevates the momentum of the trump card by justifying the magnitude of the content.